Lately, I’ve heard a few complaints from people about, “not having enough room” on their property to put in more food-producing plants. I find it so silly for them to limit their food production with that kind of thinking. 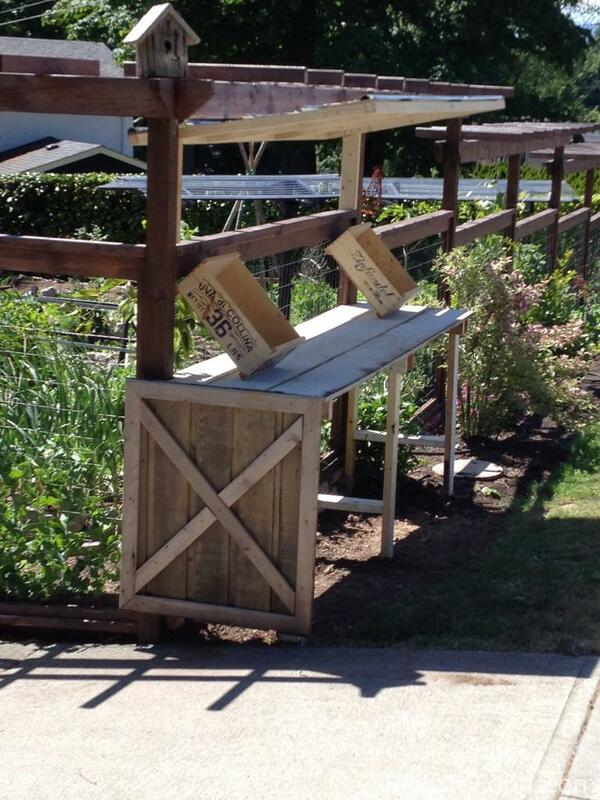 Most of us have so much possible garden space, that just isn’t utilized to its full potential. People in any other part of the world, would be ecstatic with the growing ability that we are blessed with. 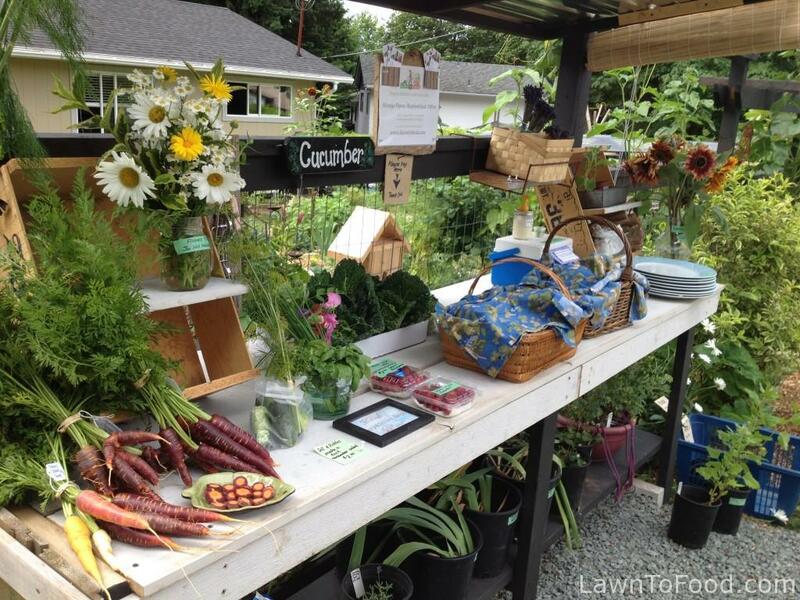 Let’s take advantage of the many options we have for producing our own food! This is a picture of our front yard boulevard in the spring of 2012. 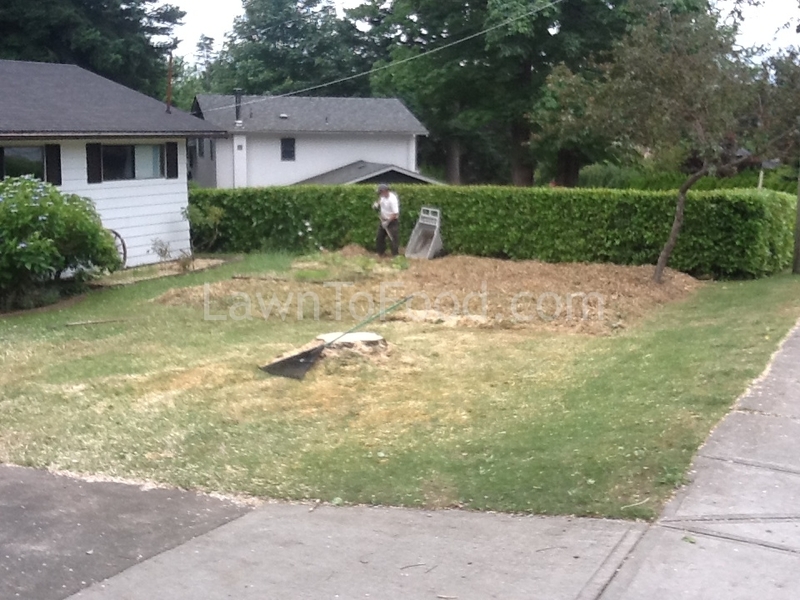 There is 3 or 4 feet of lawn on the right, that slopes down from the sidewalk. That boulevard property belongs to the city but it is our responsibility to maintain it. 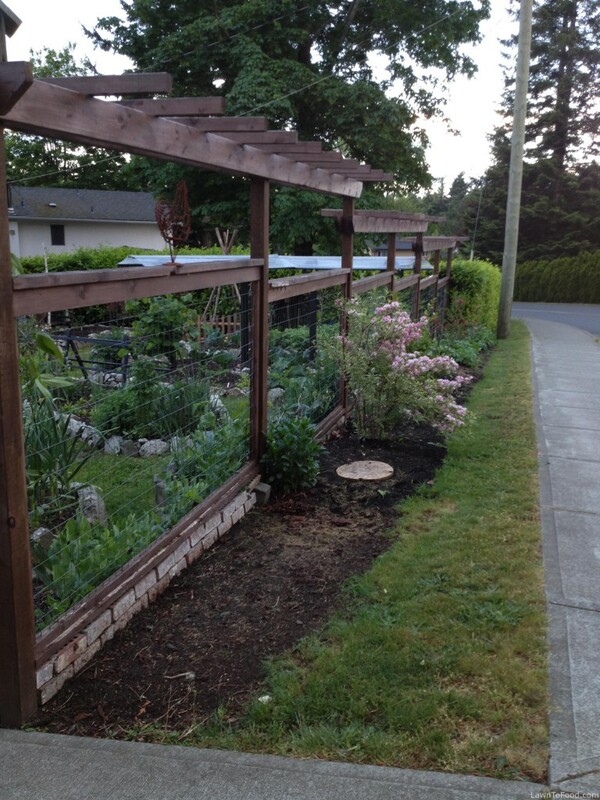 After getting the front yard vegetable garden established, and fenced, I started to focus my attention on the boulevard strip. 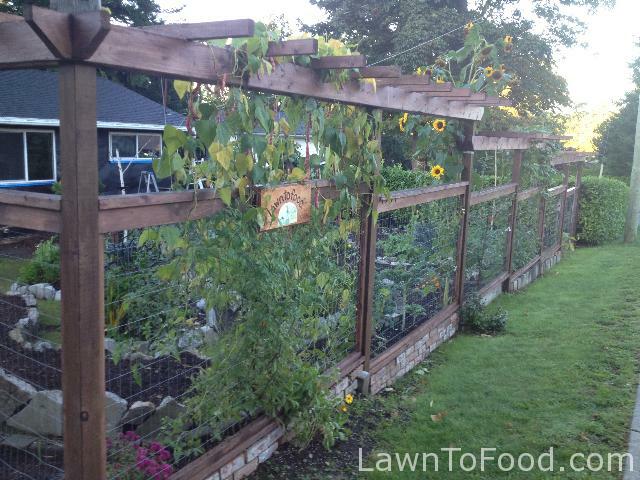 I wanted to plant some deer-resistant shrubs there to help deter them from eating peas and beans that I planned to grow up the mesh fencing. Shrubs would also provide wind protection, bird sanctuary, privacy, color and leafage in the winter months, if I choose a few evergreen varieties. Last fall, I started the boulevard garden by covering the lawn with leaves. I used six bags of maple leaves from the neighbour before the Yard Waste dump truck came and collected them. 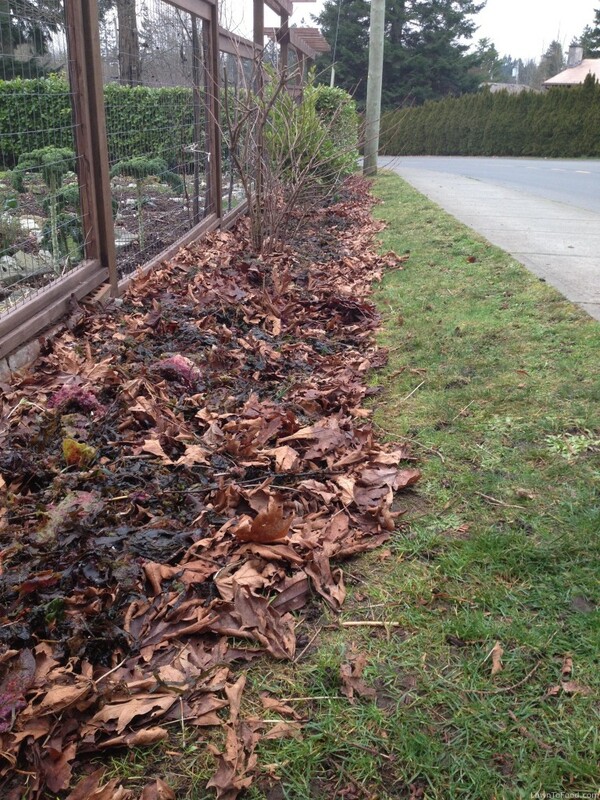 The leaves would start to decompose over the winter, producing rich organic matter and smother the sod beneath. 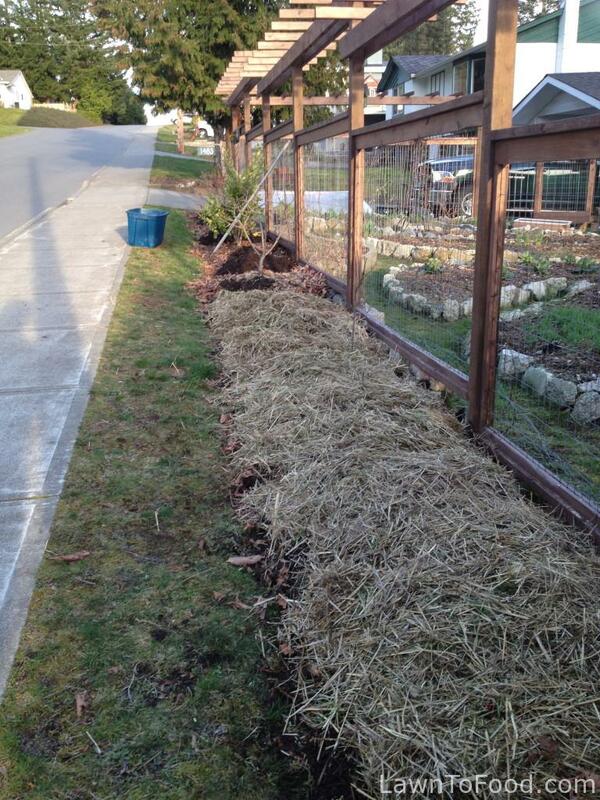 I also spread a few fork fulls of horse manure on top of the leaves, around the two shrubs that I planted. One is a variegated crab-apple type and the other is an evergreen bush that produces berries for birds. During the stormy winter months, we collected seaweed that washed up on the shores of our local beaches. A layer was added on top of the boulevard leaves and manure. In March, Hubby added about 5 wheelbarrow loads of finished compost to the boulevard layers. 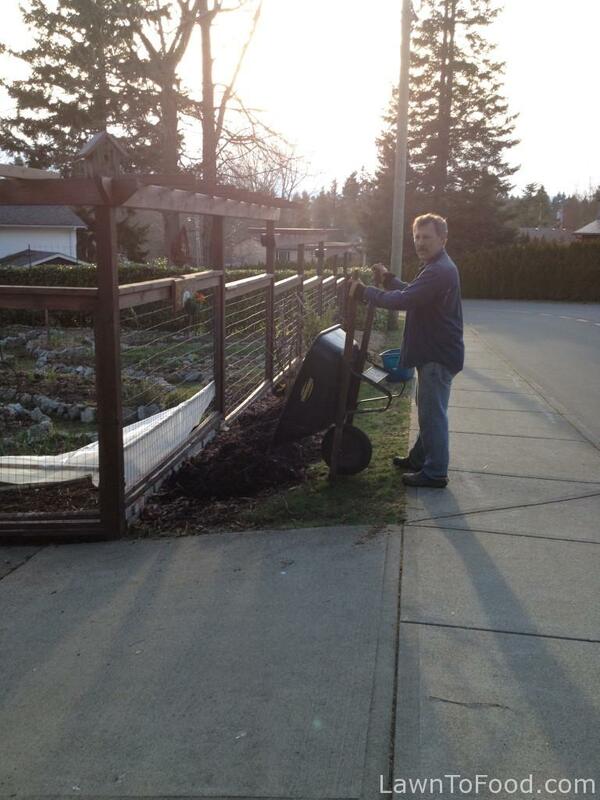 The compost was full of worms which will help turn the lower layers into soil. At this time, I didn’t have a clear plan of which shrubs I was going to purchase for the front. What I did have on hand, was a bag full of seed potatoes with their eyes bugging out! I thought why not plant them on the boulevard? It would give the potatoes somewhere to grow (I hadn’t finished building a backyard space for them) and utilitze the boulevard area until I begged, borrowed or purchased other plants for the space. I placed the seed potatoes directly on top of the compost layer and covered them with some old straw. 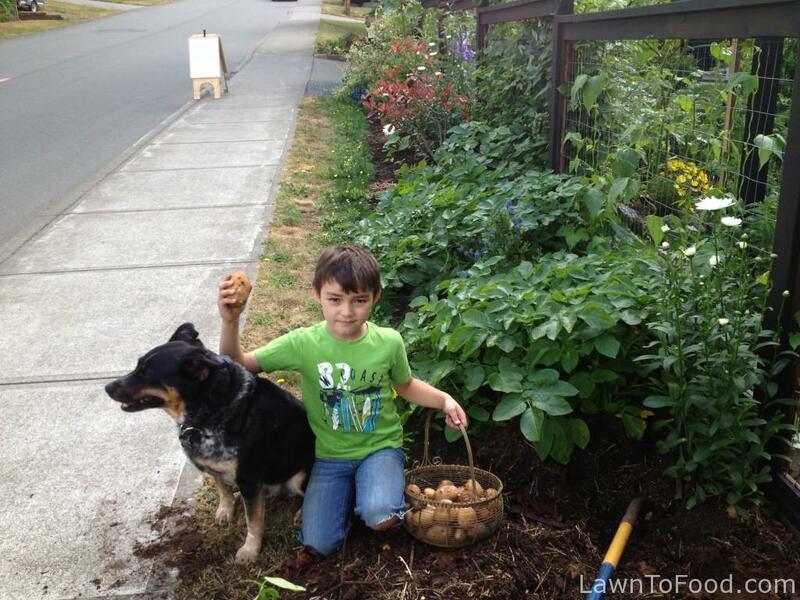 Within weeks, the potatoes had sprouted through the straw layer. 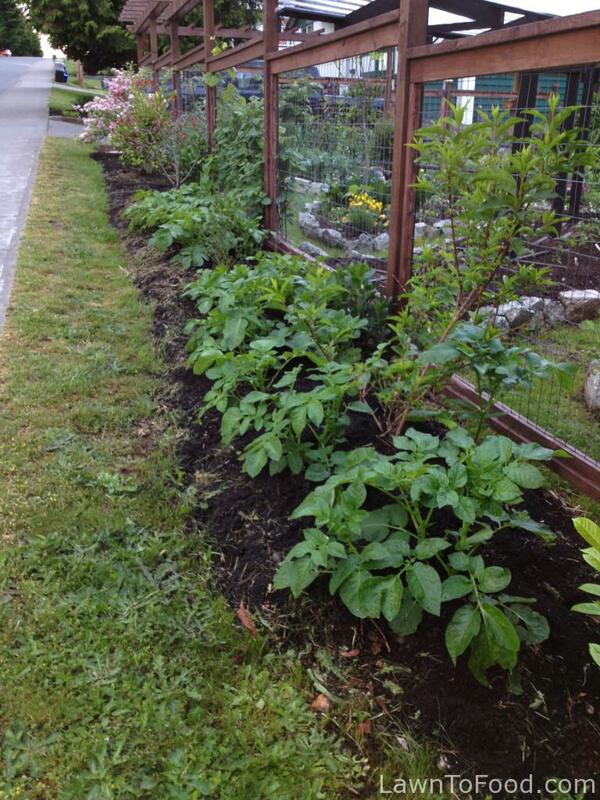 I added and mounded about 6″ of soil up around the stalks, to protect the new potatoes from turning green (new potato tubers cannot tolerate being exposed to sunlight). Now we’ll wait a few more weeks and then harvest young potatoes to steam with butter, or mix with lemon & dill for a delicious potato salad. Yum. I’ve added a few clumps of Shasta Daisies, Sunflowers, Calendula, a Forsythia, a Laurel and a California Lilac that will keep its green foliage all winter. The boulevard is looking lush and full already. Even though the deer have wandered through (I can see their hoof prints in the top soil), they haven’t eaten the potatoes or the new plantings. 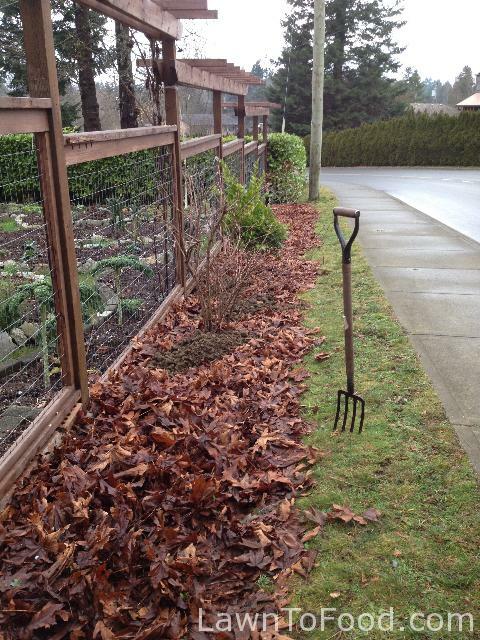 In the foreground below, I have raked away all of the leaves and compost. You can see how successful the layers were at smothering the lawn. I cleared this space to build my Urban Famstand. I have so many vegetables this year, I want to share them with the neighborhood ! 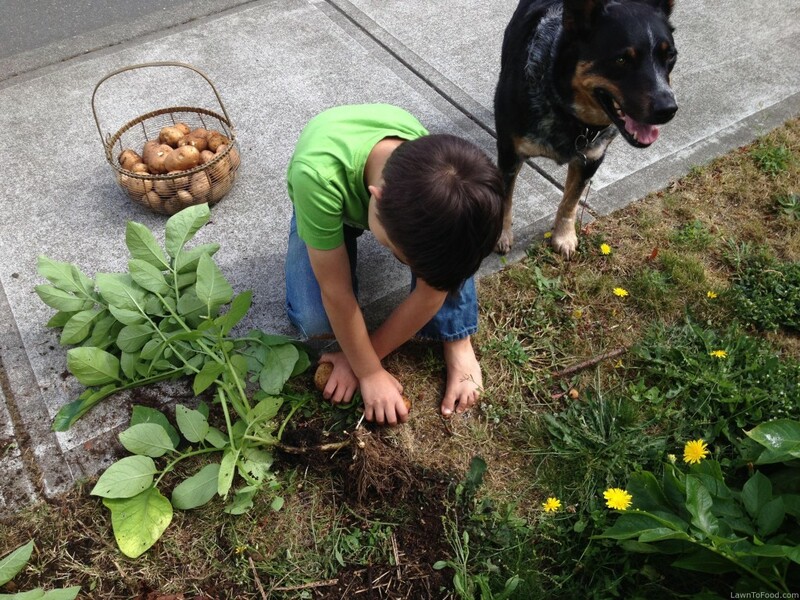 This is our grandson, “Brusselsprout”, havesting some of the boulevard spuds with his side-kick, Buddy, the Aussie Cattledog. This entry was posted in Compost & Soil Condition, Containers & Small Spaces, Crop Planning, Gardening w/ Kids, Growing Food, Reep the Harvest and tagged grow food, limited space, potatoes by Lynda. Bookmark the permalink.